Consciousness creates all material reality. Biological processes do not create consciousness. This conceptual breakthrough turns traditional scientific thinking upside down. 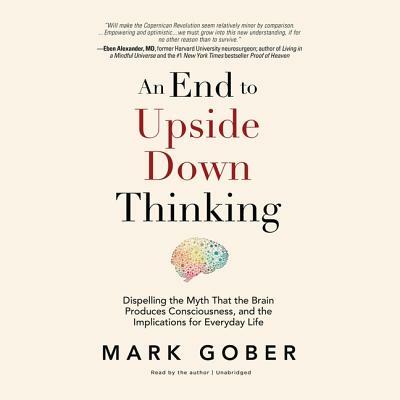 In An End to Upside Down Thinking, Mark Gober traces his journey-he explores compelling scientific evidence from a diverse set of disciplines, ranging from psychic phenomena, to near-death experiences, to quantum physics and beyond. With cutting-edge thinkers like two-time Nobel Peace Prize nominee Dr. Ervin Laszlo, chief scientist at the Institute of Noetic Sciences Dr. Dean Radin, and New York Times bestselling author Larry Dossey, MD, supporting this thesis, this book will rock the scientific community and mainstream generalists interested in understanding the true nature of reality. Today's disarray around the globe can be linked, at its core, to a fundamental misunderstanding of our reality. This book aims to shift our collective outlook, reshaping our view of human potential and how we treat one another. The book's implications encourage much-needed revisions in science, technology, and medicine. General readers will find comfort in the implied worldview, which will impact their happiness and everyday decisions related to business, health, and politics. Stephen Hawking's A Brief History of Time meets Eckhart Tolle's The Power of Now.